There’s been a lot of excitable chatter about Jeremy Corbyn’s economic policies. Newspaper pundits and Labour Party grandees have queued up to denounce his plans as a return to the dark days of 1983. This is the year Labour stood in the election on a left-wing platform, and lost by a landslide to the Tories, led by Margaret Thatcher. The talking heads have a point. Jeremy Corbyn’s manifesto is close to one of those from that fateful year. But it’s not Labour’s. It’s the Social Democratic Party. 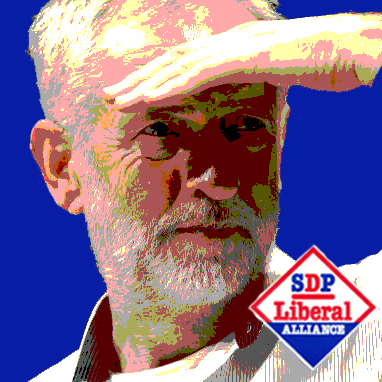 The SDP was set up by a small group of leading Labour Party figures, disenchanted with Labour’s shift to the left. They stood, in 1983, in alliance with the old Liberal Party. They are today best remembered for splitting the anti-Tory vote, and so helping Thatcher to two successive election wins. Corbyn, too, attacks Tory spending cuts and calls for “public investment in new publicly-owned infrastructure”. But unlike the SDP, Corbyn thinks “Labour should not run a public deficit”. Corbyn is more fiscally conservative than the “moderate” SDP. There’s more. The SDP called for government spending to directly create 250,000 jobs over two years, plus another 100,000 in the NHS and social services. In total, they wanted to reduce unemployment by 600,000 in two years. Corbyn has called for monetary policy to be used to boost investment, in the form of “People’s Quantitative Easing”. The SDP wanted less “restrictive monetary policy and management of the exchange rate” to help create 400,000 new jobs. Both the SDP and Corbyn are concerned about what the SDP call “excessive” pay in the private sector, with the SDP pushing for a “Prices and Incomes Commission” to regulate pay. Both agree on the need for an industrial strategy, backed by investment in high-tech research. But the SDP also wanted to radically expand the range of worker participation in their businesses, including a mandatory employee right to information. The difference is clear. Corbyn’s economic policies, today, place him to the right of 1983’s moderates. If we must make decades-old comparisons, perhaps this is the one to make? Corbyn really isn’t all that left wing. He’s really a sort of extreme liberal. His campaign is worth supporting though because it will break the consensus and the grip of the Labour Party machinery over the labour movement. It will open the debate. I think sadly labour will just be refused help by the Progress drones and everything Corbyn does like Miliband will have to pass the Progress test. Miliband lost he could not even beat a Tory coalition which was hated, Miliband was seen as weak and in the grips of progress, Corbyn will need to try and break that lot up, can he do it I doubt it. I’m sorry but I think the next election is already being celebrated by the Tories no matter whom wins. He is also a pacifist which is an outlook antithetical to the interests of working people valuing as it does peace above all else including justice which is no good for exploited classes and oppressed peoples struggling for liberation. He needs to break from that view and also from the wretched pro-Putin Stop the War Coalition and the Zionist’s bogus two state peace lie which even if successful and it is not intended to be would be an alliance against the Palestinian people. As for the 2020 election it is going to be extremely difficult for anybody to get Labour elected by then as the hatred for New Labour is intense and the memory of their calamitous spell in power will still be fresh but if anybody can it will be an anti-austerity candidate. For sure any of the other three winning will see Labour wiped out. There has always been this almost obsession with Labour needing a great Leader. But if Jetemy wins he may just be right for what the grassroots of Labour needs – a facilitator of power.